There was no good reason for Renault to revive its classic sports/racing car division, Alpine. Renault did it anyway, and now they've partnered 50/50 with Caterham to design the car. You're excused if this all sounds like a dream come true. SCaterham will own 50% of the Alpine company, currently owned 100% by Renault. Renault CEO Carlos Ghosn and Caterham Chairman Tony Fernandes announced today that their two companies will collectively design a number of future sports cars. Yes, they put a plural in their press release. Yes, there could be more than one Alpine model. Caterham will get to sell the future Alpine cars as well, giving Renault more bang for every buck it invests in the Alpine company. Production efficiencies are vital, even at the level of low-volume sports cars. How light? 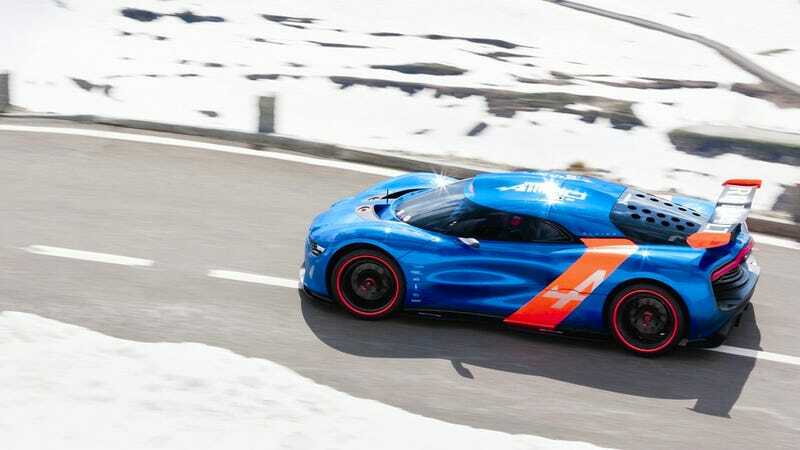 When the Alpine brand was re-launched in Monaco this past May, the weight goal was set at 1.2-1.3 tonnes (2,640-2,860 lbs) and power was set at 200-250 hp. The production target was set at 5,000-10,000 units/year at a cost of 35-40,000 Euros ($44,765 - $51,160). Renault's plant at Dieppe, France, where they build the highly-praised Renaultsport Clio, has a significant amount of extra production capacity. Caterham has the know-how to design extremely light weight vehicles. Renault could use both Caterham's expertise, and Renualt could use an extra market for these low-volume cars. Caterham could definitely use another model in its lineup. This partnership sounds quite attractive to us. We've been bitten before (Caterhams' Deputy Chairman admitted Alpine's last partnership with Lotus was "put aside in spectacular and well documented style"), but we want this to be true so very, very badly. The world can never have enough beautiful, lightweight sports cars.